A PlayStation 4 console with 1TB of internal storage space has been officially announced by Sony, and is being dubbed the ‘1TB PS4 Ultimate Player Edition.’ The upgraded console only doubles up on the existing storage of the PS4 while everything else remains untouched. The PS4 usually ships with a 500GB internal HDD, and while that may seem to suffice for some users, it did not for quite a few individuals, as digital copies of games started to hog up as much as 30 – 40GB of storage space on the console. Though the most important part, as highlighted by Sony, is that not only does this mean users can now store more games on the machine, but can also extend their play with more add-on content, while saving and sharing their gaming highlights. The news of the 1TB PS4 comes in a few days after Microsoft had announced and released the Xbox One with a 1TB HDD, giving gamers a whole lot of room to play around with. Interestingly, Microsoft’s console is also shipping with a new controller (not the Elite controller though), while the popular Halo spinoff title Halo: The Master Chief Collection also made available in a select few regions. Sony on the other hand, has no such designs for promoting the 1TB console with and will be sticking to the usual goodies shipped in the PS4 retail box. For those unaware, the PS4’s hard disk can actually be upgraded or replaced without voiding the warranty, which means existing users can easily throw in a 1TB HDD for a nominal price, and even a 2TB one if their budget allows it. Meanwhile, Sony had also announced a while back that unlike the Xbox One which will be offering backwards compatibility for Xbox 360 games, the PS4 has no plans for giving users such support for PS3 games in the near future. 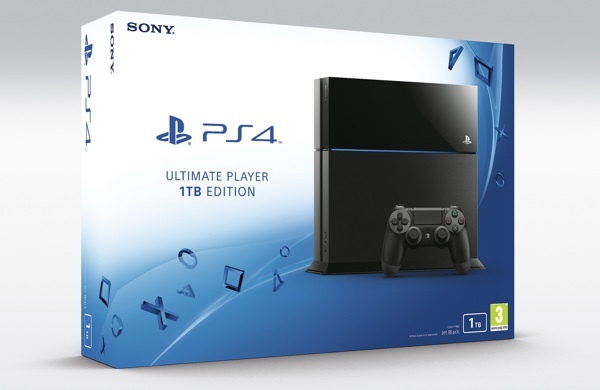 Sony has not ushered a word about the price of the new 1TB PS4 console, but instead states that “For pricing information, check with your local retailer.” Set to be officially released on the 15th of July, the console is expected to be available in a select few European and PAL territories at launch, and will consequently flow over to other regions later on. Given the whole user-replaceable HDD option on the cards, it will be interesting to see just how much of a premium Sony charges for the new 1TB PS4 Ultimate Player Edition. I wonder where they are sourcing the new hardrive from? I’m not a gamer but this looks wonderful. I even like the retail box. Save your breath and tell that to Sony. Sony isn’t going to read redmondpie, will they ? Lol I highly doubt it… But redmond pie might forward the consumers message. Its worth the try.